Mr. Morgan has always been my go-to attorney. I’ve referred multiple people to him (including my mother). I will continue to work with him as he’s competent, honest and always delivers. And his staff is always so nice and ready to help. Mr. Morgan and his staff are very knowledgeable experts in their field. They are a young, vibrate team who work together to make it happen!! Thanks Mr. Morgan for your gifted talents from above!! I highly recommend Mr. Morgan and his team, they have all been very thorough and helpful with my case every step of the way. Diana has always responded my calls in a timely manner and goes above and beyond! Thank you guys!! Mr. Morgan is an excellent attorney! My experience with the Law Office of Spencer Morgan was great. Mr. Morgan is a very compassionate attorney with a strong team behind him. Everyone at the firm was incredibly kind and helped settle my case quickly and provided me with a fair settlement. I was guided through the whole process and received frequent updates from Mr. Morgan about the status of my case. I highly recommend Spencer Morgan Law! 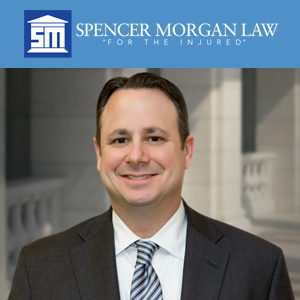 I was recommended to Spencer Morgan Law via my Physical Therapist while receiving treatment after a car accident. I was getting nowhere with my own vehicle insurance company in regards to my treatment coverage. Mr. Morgan's office met with me and explained the process from the beginning and walked me through every step. His office was very gracious in answering my every inquiry via phone, email, text, etc. I especially commend Diana Mejia, who works with Mr. Morgan, they were both very patient and kept me updated on my case constantly. Thankfully my case has come to a close and we were able to reach a fair settlement. I highly recommend their services. What an incredible team at the Law Offices of Spencer G. Morgan. Their attention to detail, professionalism and sincerity went a long way with me. I dealt mostly with Andrea Morillo and Mr. Morgan (himself), and I could not have been more pleased. An abundance of thanks to each of you for your assistance (in my time of need). I highly recommend the Law Offices of Spencer G. Morgan to anyone who has suffered an accident and seek legal advice (from a pretty remarkable lawyer). -- T. G.
I am very grateful for the treatment and service that your office provided me. Everyone was very sympathetic. I highly recommend Spencer Morgan Law. -- F. G.
My experience at Spencer Morgan Law has been excellent. They are very professional, they answered all my calls, and I was very satisfied with the services and result. -- B. O.
I had a great experience working with your office. All the staff starting with the receptionist was very professional and I am happy with the outcome of the case. Thank you for help on this case. -- C. D.
We are pleased and grateful with the representation by Attorney Spencer Morgan and with the attention of his staff. We are also very thankful and pleased with the results! -- C. A. The Law Offices of Spencer Morgan are true professionals, always very attentive. I will always bear in mind the firm of Spencer Morgan for anyone that may need the best to represent them. I thank each and every one of the staff of Spencer Morgan for all your diligent work on my file. Many thanks!! -- H. M.
I was very satisfied with the outstanding job on my case by Mr. Morgan. Although this was a difficult time he catered to my specific needs as a client. -- J. B. It was the best decision to choose Spencer Morgan because he was honest and serious in his work. I am very appreciative for his representation. Many thanks to his team in general as they are also very professional. -- J. L.
Mr. Morgan was great for me. He really fought for my case and negotiated very well in my favor. Every time I called his office his assistants were very professional and attentive with me. Overall, great customer service and excellent representation is what you will get when you hire Mr. Morgan. I highly recommend him based on my experience. -- A. P.
Thank you to Mr. Morgan for his help and assistance on my case. I feel very satisfied how the case ended up. -- A. S.
Attorney Spencer Morgan and his legal assistant Andrea gave excellent attention to both of my accident cases. Choosing Spencer Morgan was a very good experience and I recommend them highly. -- H. P.
I am very content with the treatment, service, and communication I received at Spencer Morgan Law. Every step of the case was explained to me in the best possible way. The resolution of my case was excellent and I am very grateful for the way I was treated. Thank you, thank you very much! -- L. F.
I highly recommend attorney Spencer Morgan. It's been a wonderful experience having them on my side during a difficult time. His staff is amazing and give great attention and prompt communication. -- L. P.
The personnel at Spencer Morgan Law were very helpful in answering any questions that I had. It was a positive experience and they were very thorough. I would strongly recommend Mr. Morgan to anyone. The medical providers were very professional and thorough as well. -- A. M.
I wanted to express my sincere thanks and gratitude for all your efforts dealing with such a difficult company. Without your efforts I would never have received the settlement you managed to get for me. You and all your staff have been so easy to deal with and fought for me through the whole fight. I would highly recommend your services to anyone seeking a professional caring attorney who fights to get results. Yours sincerely. -- I. M.
I was recommended to Spencer Morgan by my brother. I must say that I'm glad I took the recommendation. From start to finish I was helped with what may have been hundreds of questions that I had regarding my case. In addition, my calls and emails were always replied to promptly. The outcome was favorable and I will recommend them moving forward. -- L. A.
I want to thank all of you from the bottom of my heart for the excellent job you and your staff did for my case. You always showed real professionalism and answered all my legal questions from day one. I especially want thank you putting together the perfect team to make my case a big success. When it comes to having the right legal representation, the right attorneys can make all the difference. Even by just walking into the mediation room. You showed me that! I will always refer anyone I know, including family members to your firm. Hopefully I won't need your services any time soon. But if i do. I know I will be in the best care possible. -- W. H.
My experience with Spencer Morgan Law was excellent. He and his staff provided great attention to my case. -- J. R.
I was with a big personal injury law firm that I had heard about on the radio. After close to six months they basically said I had a great case but I did not fit their cookie-cutter mold so I could not be put in their mill of accident clients. I heard about Spencer Morgan and met with him. Without worrying about his fee, and to do what he thought was best for the case, he teamed up with a top-end trial attorney to strengthen the case. To make a long story short, it was a wonderful experience from beginning to end. The staff was fantastic and Spencer was right there when I needed him. You will never regret your choice if you go with this law firm. They really know their law and they also really care about their clients. You are more than just a number in a big law firm that advertises a lot and treats everyone in a cookie cutter fashion. -- J. M.
The way Mr. Morgan spoke to the insurance representative was as effective as it was passionate. I am very grateful for his help. -- S. T.
Spencer and his team were so professional and attentive handling my personal injury case. I felt supported from beginning to end. -- K. R.